This engraved Belgian Beer Glass has a tulip-shaped design with a curving bowl is perfect for Belgian beers and the inward tapering top captures aromas. The glass brings out the character of the brew, with a short thick stem and sturdy foot. 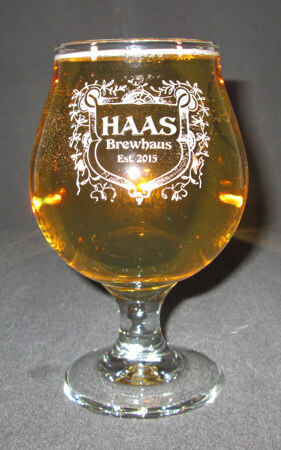 This personalized beer glass is 6 inches tall and holds 16 ounces and can be custom personalized as you wish. Personalization, text and/or design, on the front of the beer goblet is free, other options are available for an additional fee. We suggest keeping your text to 4 lines of 18 characters per line, it is okay to go over, it may just be smaller to fit it on the glass.